So I mentioned how good Wargames, Soldier and Strategy was as a magazine on my Facebook timeline and as a result have had a couple of comments about it. I thought then a brief mention of Issue 71 was well in order. 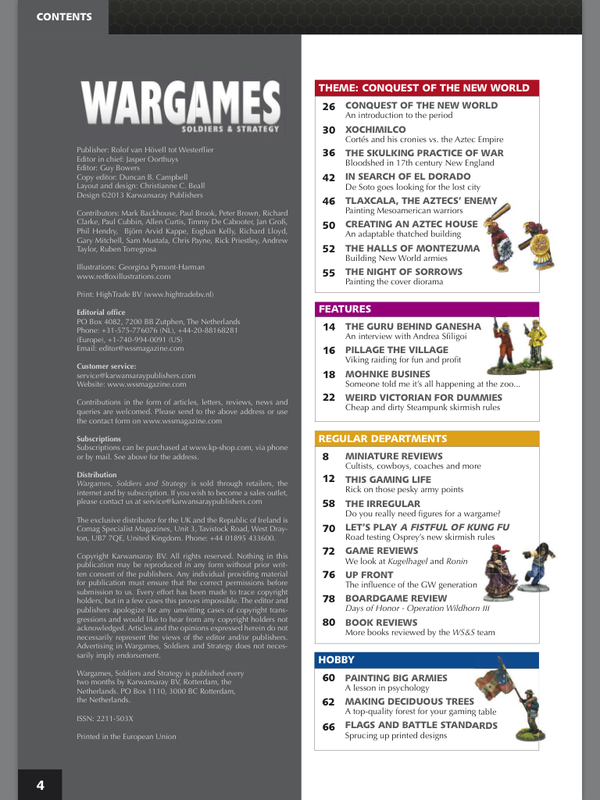 There are then the regular features, which are normally an interview with a personality from within the wargames world, Pillage in the Village (Viking raiding for fun and profit and probably topical given the start to Vikings Series 2 recently), Mohnke Business (work that out yourself) and some Steampunk skirmish rules. The Regular Departments which include reviews of miniatures, Rick Priestly’s column (always a good read), game reviews, road test of rules, boardgame reviews and book reviews. The last section is hobby general and usually covers tasks such as painting big armies, making terrain, flags etc. All in all, it is a great read and delivered digitally, brilliant value. The digital edition comes as a PDF and you can view it anywhere you can view a PDF file. Highly recommended and my a long-shot, my favourite general wargaming magazine currently. My only criticism is that it only comes around every two months! Completely agree — it’s the best wargaming mag around at the moment IMO, and it’s great that all the back-issues are also available for download. Last issue on the Successors was really good as well. Yes, the front cover of the Successors issue almost had me reaching for the catalogue of 28mm figures – that was so neat. Interestingly I think the same cataphracts make and appearance in the current issue of Wargames Illustrated.